Clad only in loincloths, despite the snow underfoot, and brandish­ing flaming torches as they chanted and danced, the men of Otari, Nagano Prefecture, had an interesting way of welcoming the arrival of spring. It was a pleasure to be back in the town—that is twinned with my home­­town of Ottery St Mary, in Devon—for yet another of their traditional festivals. It was also a reminder of how tough life can be in winter for those who actually live up in the mountains, rather than just go there for a ski break. You wonder how they coped in the days before mechanised snow ploughs and tunnels through the mountains, when neighbouring communities in remote areas were isolated from each other for months on end. On the way back to Tokyo, we stopped at the famous Jigokudani Monkey Park to watch macaques relax in the warmth of an onsen. At first glimpse of this iconic image of Japan, we felt tempted to jump in and join them. But a closer inspection of the murky water suggested that, perhaps, the monkeys were not fully signed up to onsen etiquette. February had a bit of a Welsh feel to it. I hosted a reception to welcome Robin Walker, the newly appointed head of the Welsh Government’s Tokyo office, which is located inside the embassy. 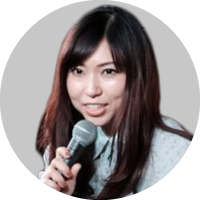 Robin is a Whitehall civil servant by back­ground, but previously lived here teaching on the Japan Exchange and Teaching (JET) Programme. I was particularly impressed by the Japanese Welsh-style male voice choir who sang at the reception. My video tweet of their performance got more than 6,000 views. paid his second visit to Japan. As a member of Prime Minister Theresa May’s Cabinet, he was well placed to brief interlocutors on the latest Brexit developments. He spent time in Tokyo, Nagoya and the Kansai region, visiting a range of Japanese firms which are investors in Wales. In February, our security engagement continued in London with the annual pol–mil (political–military) talks, which included senior officials from the Foreign & Commonwealth Office (FCO) and the Ministry of Defence, along with their Japanese counterparts. They worked on concrete plans for joint actions to implement the closer cooperation outlined by the two prime ministers in January. 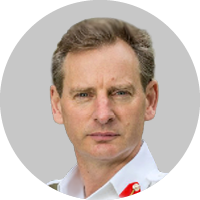 Later in the month, General Sir Mark Carleton-Smith, chief of the General Staff and head of the British Army, spent a week in Japan meeting his counterparts. The army is keen to develop stronger ties with the Japan Self-Defense Forces, just as the Royal Navy has been doing so actively over the past couple of years. Deputy National Security Adviser Madeline Alessandri also came through for meetings with Japanese government bodies dealing with issues such as terrorism and cybersecurity. On 14 February, I found myself hosting a dinner for her with Japan’s Ambassador in charge of Cyber Policy. It was very useful and productive. Meanwhile, the Japanese Ministry of Foreign Affairs and the UK Depart­ment for International Development held their annual develop­­ment talks in London. The two countries, both among the world’s leading aid donors, had a useful exchange of views as they identified specific projects where we can work more closely together, drawing on each other’s respective strengths. In February, we learnt the sad news that Honda intends to discontinue production at its Swindon plant when the current model range comes to an end in 2021. This was disappointing, both because of the 3,500 workers who would be losing their jobs and because of Honda’s history as one of the earliest Japanese investors in the UK. Honda made clear that the decision was not a result of Brexit, saying it had more to do with the big global challenges affecting the industry, such as the shift to electric vehicles. Their next-generation vehicle production is not being relocated to another European country but to a base in one of their other major markets. Lord Mayor of the City of London Peter Estlin visited in February, with a focus particularly on asset management and fintech. He brought with him an upbeat message on the future competitiveness of the City of London as a global financial hub and fronted a seminar with Tokyo Governor Yuriko Koike, to take stock of the implementation of the memorandum of understanding signed by his predecessor. Tokyo has drawn a number of lessons from the way the City of London Corporation organises itself. They have recently designated a new “financial mayor” to give shape to their international offer. A former deputy governor of the Bank of Japan, Hiroshi Nakaso brings to the role great credibility with both the industry and regulators. I returned to London for an annual prosperity conference organised jointly by the FCO and the Department for International Trade. Whilst I was there, I took the opportunity to deliver the annual Ambassador’s lecture to the Japan Society, which drew a couple of hundred people to the head­quarters of Nomura Holdings on the banks of the Thames. I also spoke to the Whitehall & Industry Group, which brings together high-flying leaders from the public and private sectors. At the same conference, exactly a year ago, I had been stranded in London by a freak snowstorm. This time Britain experienced its hottest-ever February temperature. I guess that’s what climate change is all about. As we work on plans for our celebration of UK in Japan 2019–20, which will run from the Rugby World Cup 2019 to the Tokyo 2020 Olympic and Paralympics, I hosted a meeting with representa­tives of many British firms here to identify opportunities for them to be involved with the campaign as partners and sponsors. There seemed to be a lot of excite­ment about these forthcoming major sporting events and an enthusiasm to get involved. We had a fun meeting with UK-based comedian Yuriko Kotani, who we will be working with on our consular messaging campaign directed at visiting rugby fans. She had lots of good ideas on how to communicate important messages in an accessible and humorous way. 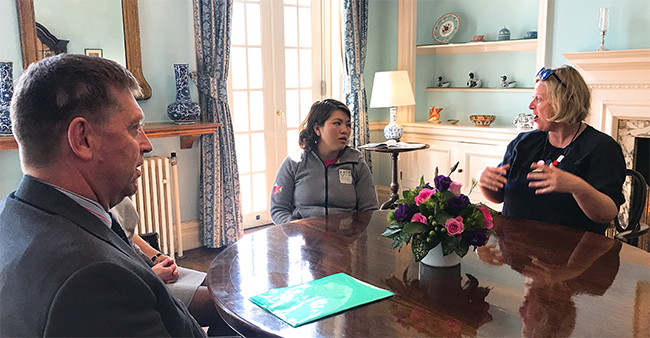 I hosted a roundtable with Jenny Sealey (below, right), the deaf artist responsible for the Paralympics opening ceremony, and Eri Yamamoto-MacDonald (left), Japanese para-powerlifter and Tetsuya Takeuchi, the first-ever NHK Senior Commentator to use a wheelchair. We had a fascinating discussion about the role that both sport and the arts can play in promoting understanding of disability among the wider public. You will be able to view some of this conversation on the Embassy’s social media. Tokyo is very keen to emulate the successes of the London 2012 Paralympics. 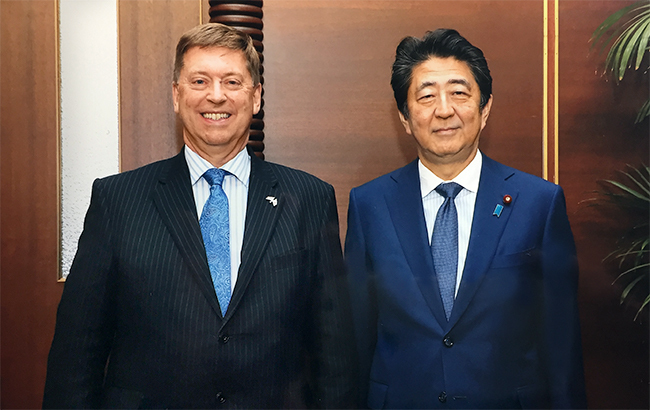 Some ACUMEN readers will have had the chance to meet British Olympics Association (BOA) Chief Executive Officer Bill Sweeney on one of his many visits to Tokyo. 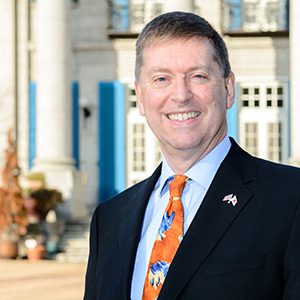 He was interviewed in the January issue, and in February announced that he will be leaving the BOA. But we will still be dealing with him as he is becoming CEO of the Rugby Football Union. 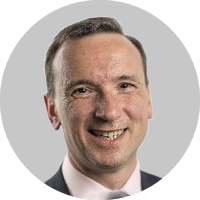 We have also just seen a change of guard at the British Paralympics Association, with CEO Tim Hollingsworth heading off to run Sport England. His successor, Mike Sharrock, visits Japan in March. 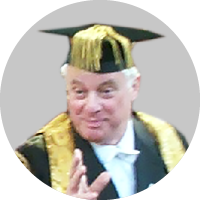 In March, University of Oxford Chancellor Lord Patten is due to be back in Tokyo, which is this year’s host city for the university’s annual Oxford in Asia events. He will be joined by a selection of Oxford alumni and luminaries, including my predecessor Sir Tim Hitchens, who is now head of Wolfson College. Commonwealth Day falls on 11 March, and I will be hosting an event on 12 March to celebrate this with my colleagues, the ambassadors from Commonwealth countries here. 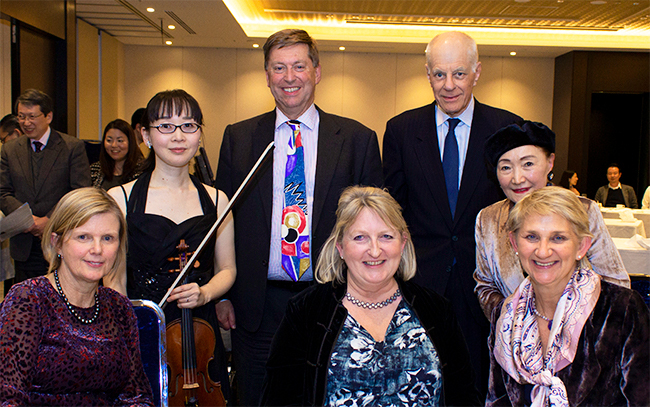 A British Serenade Dinner Concert performed by the Tokyo Sinfonia at the Foreign Correspondents’ Club of Japan—attended by quite a few members of the British community—was a very pleasant way of ending the week on a Friday evening in February.